As standard, the EG300 is supplied with two circular sawblades for use as an edger. One blade is fixed and the other is adjustable from the operator control console - using the electronic Setworks system to accurately pre-set the required width of the board. Optional lasers can be installed to assist the operator in determining the precise width for maximum recovery. 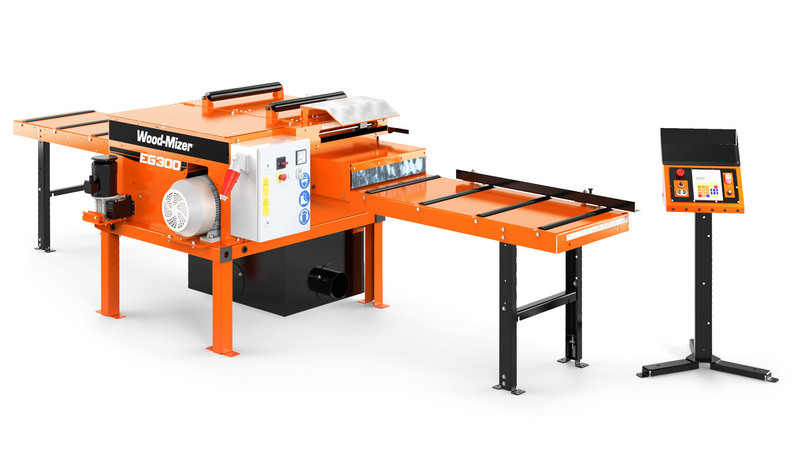 The EG300 comprises three main components - the main saw unit, the infeed table and the outfeed table. This modular construction ensures easier transportation, handling and installation. Two top rollers make it easy to move a board back to the front of the edger for a return pass. An adjustable fence allows the operator to quickly position boards with an already straight edge. Optionally, the EG300 can be fitted with up to five circular sawblades for multirip applications. Four of the blades are fixed for cutting standard widths and the fifth is movable. Changing between edger and multirip operations is simple, and this flexible design allows the operator to react quickly to changing demand. Power feed is variable from 0-20 m/min. Quickly add multirip functionality by adding up to three additional fixed blades. Rugged electronics quickly position the adjustable blade to precise measurements. Make it easy to return boards that require a second pass.